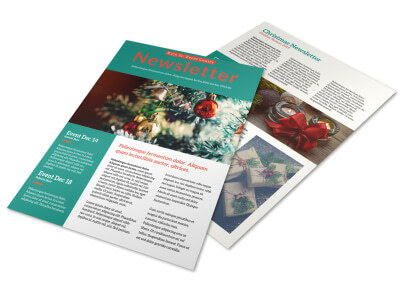 Put together a festive edition of your regular newsletter with ease when you take advantage of our holiday newsletter templates. Spread joy with the release of your monthly or quarterly newsletter with newsletters featuring holiday designs and emblems. We make the process fun and simple; select your template, add photos, blocks of text, graphics, and more to get your news out there in the hands of employees, co-workers, vendors, and others. 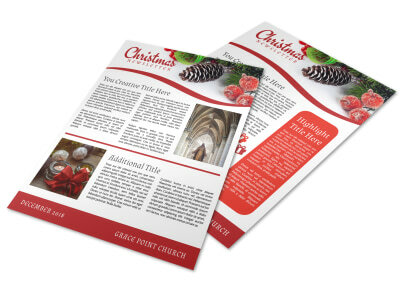 Include a promotional coupon or special offer to make the holidays merrier, and then print your newsletter from any location for instant distribution to your market base. “It’s beginning to look a lot like Christmas…” The Christmas season is the perfect time to send out a year-in-review newsletter to your clients and employees. Share the year’s happenings and projections for the New Year. Analyze market trends and sales data, and give insight into new technology and products. Highlight major successes and spotlight key employee contributions. Include photos of employee and customer appreciation events and craft a heartfelt “thank you” to each group of stakeholders. Put together a Q&A section where you answer specific or common client inquiries – turn yourself into a regular Dear Abby or the crew of Ask This Old House. Wrap the year up in a big bow by sneaking in a favorite holiday recipe – our online editor makes the process easier than delivering 7 billion presents and circling the globe in one night!